In other words, she plays a bit of everything. 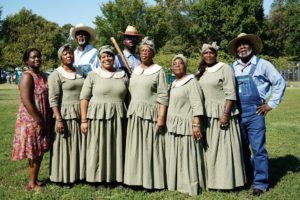 Most famously, Giddens is co-founder of the Carolina Chocolate Drops, which Wikipedia calls a “blues and old-time music band.” She also has released a couple of solo albums. The Greensboro, NC native is an alumna of the North Carolina School of Science and Mathematics and the Oberlin Conservatory, where she studied opera. She was in what the Wikipedia profile calls a “postmodern string band” called Sankofa Srings, which eventually became the Carolina Chocolate Drops. She worked a caller at contra dances and played in a Celtic band called Gaelwynd. Giddens did not leave opera behind, however. Singing soprano, she formed a duo called Eleganza with mezzo-soprano Cheryse McLeod and released a CD in 2009. 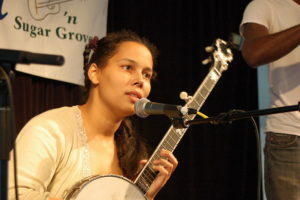 She became the only original member of the Carolina Chocolate Drops in November, 2013 and has gradually turned more toward her solo work. She has a recurring role in CMT’s “Nashville,” in which she also sings. History and music are inseparable in Giddens’s view. She points out at an article at NPR by Fresh Air’s Terry Gross that the banjo – perhaps the most American of instruments – is related to the akonting, an African instrument. She further notes that for its first 100 years in North America, the banjo was a known as a plantation instrument used by slaves. 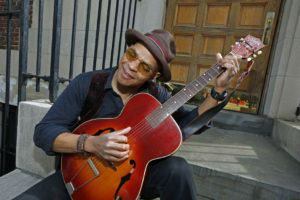 The instrument figures heavily in her solo album, “Freedom Highway.” The interesting interview also deals with growing up in a mixed race family in North Carolina in the 1970s. In a Huffington Post article, Giddens said that one of the projects she is undertaking with the MacArthur money ($625,000, with no strings attached) is a musical based on the Wilmington insurrection of 1898. The insurrection, which Giddens says often is portrayed as a race riot, actually was an attack by white supremacists on the government of the North Carolina city. Those officials were overthrown and perhaps hundreds of African-Americans murdered. The official death toll was 25. The main thing for me is that history gets taught devoid of cultural connections, and I think that that’s not a good way to teach history. Because the music that’s published or that’s recorded or that’s being done [in a certain time period] is a really important part of what’s going on then ― they’re reflections of what’s going on culturally during historical moments. And you don’t understand those moments without that context, to me. She makes an important point. The idea is that before the advent of the recording industry, there almost certainly was more genre hopping. An impact of the birth of the record industry was the segregation (literally and figuratively) of music. Suddenly, there was a category called “race records.” There were hillbilly records and country records. This, she said, led to everything that happened afterwards. Perhaps the creation of these artificial silos had a deleterious effect on the development of American music. Pitchfork’s Jonathan Bernstein on “Freedom Highway,” Rhiannon Giddens’ latest release: “The album’s beauty and gravitas come from how Giddens collapses the last two centuries of American history, juxtaposing songs about antebellum slave plantations with 1960’s Civil Rights anthems and narratives of 21st-century state violence.” The record, whose title track is a cover of a Staples Singers’ song, was nominated for Album of the Year in 2017 by the Americana Music Honors & Awards. Click here or on the image for Amazon or click here for iTunes. It’s possible to extrapolate: When people play music together in the same room, at the same church or on the same back porch, the gulfs between them are at least momentarily bridged. Each genre influences the others. That couldn’t happen if the act of experiencing music was by definition isolated (i.e., recording, sale and listening of music in isolation). That seems to fit well with the theme of The Daily Music Break, which is that our sophisticated electronics, which enables everyone in essence to program their own channel and exclude things with which they are unfamiliar with has a negative impact on the development of new types of music. It also is important to note the importance of the Civil War. For the first time, musicians from different regions were thrown together. They made music when they weren’t busy sewing labels with their names and addresses onto the backs of their uniforms so that the authorities would know where to send their bodies. 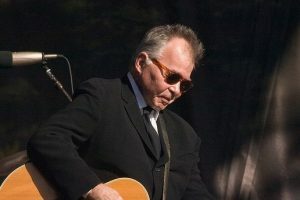 Some of the genres we know today, such as bluegrass and country, were the product of these local influences as they mixed with the German, Irish, African and other ethnic music that also was present. One side note: Anyone who likes baseball today has the Civil War to thank. My understanding of the evolution is that baseball-like games developed in the years before the war. Some had rules we would find strange today: The hitter could tell the pitcher where to throw the ball so that he could hit it (the system the Mets still use), runners would be hit by an infielder’s throw to be put out and others strange variations. They all gained popularity during the war and were brought home by the men when they were discharged. The team in Cincinnati was the first to publish rules. That version, which was disseminated widely, was close to the game we know today. Pitchfork’s Jonathan Bernstein was quoted in the blue box.